Hiring a car for your holiday and want some great routes to Tour. I am sure you know but we still must point out.In Portugal and the Algarve,they drive on the right hand side of the road. If you have never done this before,practice it in your mind for a few weeks before you leave for your holiday.In your mind change gears with your left hand whilst approaching a roundabout,checking the traffic coming from your right.Then move onto the rounabout and follow it around and leave in the correct lane and giving the correct signals and changing gears with your left hand.Practice turning left,again changing gears and indicating correctly. Practice approaching a busy cross road,chaging gears and signalling left (right and straight ahead) as you come to a stop.Check the traffic and move onto your carriageway keeping in the right lanes and cancelling signals.The same for turning right,pulling in on a busy road and pulling out again.You will be amazed how this will prepare you for the big day. Go online and get a copy of Portuguese road signs and learn their meanings.Train the mind! Remember Portuguese police operate speed traps,both camera and radar and sometimes they are hidden. Drinking and driving laws are very strict and anything more than a half pint of beer will put you in breach of the law.You should refrain from any drinking and driving at all if you want to be legal.Do not drink more than the equivalent of a litre of beer the night before if you know you will be driving the following morning.Apart from breaking the law,remeber you are not well practiced at driving on the left.Remind yourself you do not want to be responsible for injuring or killing anybody.Tour and drive safely! Remember that Portuguese Police do not need any reason to stop and breathalyse you.Just the fact that you are driving. Wearing seat belts is compulsory for everybody being carried in a motor vehicle. Normally vehicles approaching you from your right have priority unless road signs instuct you differently. Speed limits on roads in built up areas is 60 kilometers per hour. Motorways the speed limit is 120 kilometers per hour. Known great Tour around the Algarve by car. Walk around some of of the Algarves most impressive ruins.See ancient castles,visit wonderfull Alcoutim on the Guadiana river banks.Follow the river back homewards. A great little tourist trip visiting,Monte Gordo,Castro Marim,Odeleite,Alcoutim and Foz do Guidiana,returning to your start after a ninety kilometre drive. Starting off from the centre of Monte Gordo in an eastwards direction you will pass a campsite as you follow signs to Vila Real Saint Antonio.Look for signpost to Castro Marim where you will turn left and keep following the signs to Castro Marim.Get to the small town and notice a sign for Castelo (castle).You can drive right to the castle which is open from 9 am morning to 5.30 pm most days.You can wander around the spectacular ruins enjoying the scenery as well. When you leave the town resuming your Tour, follow route signposted to Mertola and Beja on the n122 driving through typical quaint villages and gentle rolling hills for roughly 15 kilometres to Odeleite whre there is a nice resevoir. You will then follow signposts to Alcoutim along lovely winding roads which require your carefull concentration.Alcoutim is well worth anybody visiting and is one of my most desired destinations to return to time and again.You will find it on the left of any page under Algarve Towns where we give considerable description of the town and surrounding areas.You will also read about some nice hotels should you want to stay awhile in this timeless delightfull location.Alcoutim has a great castle for you to explore and plenty more depending on your intinerary.You can even take the ferry over to the Spanish town,Sanlucar de Guadiana and reflect on the two towns roles in wars over the Algarve between Portugal and Spain,thankfully with Portuguese retaining ownership.Treaties were signed in the middle of this river. After a pleasant drive following the Guidiana river course you will happen upon a village called Larajeiras where you can stop awhile stretch your legs and look around the small village museum.Driving on out of the village you will follow the Vila Real st Antonio signs passing through the quaint villages of Alamo and Foz de Guidiana.You then return to Mont Gordo to complete your trip. If you enjoy driving around beautifull scenic routes "up hill and down dale" you will mostlikely love this Tour around a significant part of the Eastern Algarve region.The highlight in my opinion is at Alcoutim which is well worth a few days to a weeks holiday in its own right.If you do not hire a car you can find many similar coach trips around the Algarve and into Spain and Sevilleand up to Northern Portugal and Lisbon and Porto.Good ideas for holidays include flying to Lisbon spending some time in this lovely,active city and then proceeding down to the Algarve and on into Spain. Something Very DifferentRather than using a hire car why not try some real open air driving adventure.Quadbiking tours fit into the something different and out in the fresh air adventure touring.Posibly you did not even know this type of tour existed and it might take some time for you to accept it as something you could do.It is something you could do and is ideal for the young but just as ideal for older people as well.Why should the young have all the fun?Go on "let your hair down".Give it a go!Chances are ypou will love it! Still here? You must be slightly interested! 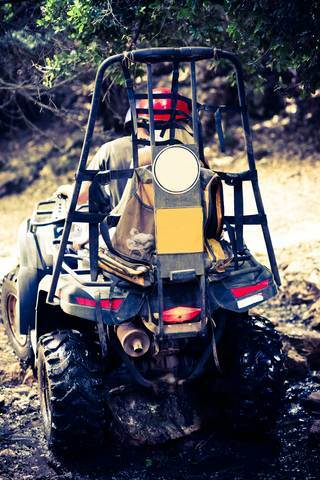 So where can you find out about this and where would one go to book quadbiking tours? Well you can find out about this by clicking the following safe link (we have checked it out for you)Quad Ventura a Very Different Tour option in the Algarve. Any Quad bike Tour with QuadVentura Algarve is suitable for all types,such as groups:Just individuals:families:Hen and bachelor parties and even corporate groups.Remember to ask if their scheduled times are not right for you.They will do everything possible to tailor something for you. A full day will be about 80 euros for an individual rider.Two sharing a bike around 110 euros. Rules:Drivers must be over twenty;have full driving license;passengers 8 years plus;50 euros deposit per bike;safety helmets to be worn..